This is still a somewhat new series on my blog, I just started it last month! 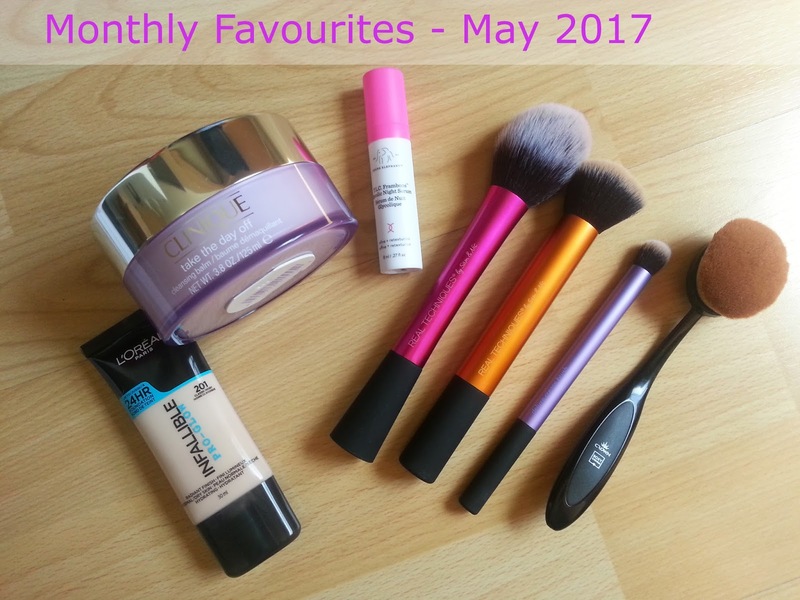 I think it's a great way to share which products I've been reaching for the most during the month. Maybe we have some similar monthly favourites?! When I first got this, I had a love-hate relationship with it. I found it applied unevenly with a beauty blender, streaky with brushes. It didn't leave the "glow" I thought it would have. The colour also seemed a little off for me, but over the past month, I've been reaching for it in hopes of a better outcome. And I did get one! Since I've been using the Drunk Elephant T.L.C. Framboos Glycolic Night Serum, I've found my skin looks less dehydrated, which meant no more uneven, patchy, foundation. I've been loving the Crown Contour Brush to apply it, and it's been working well! I picked this up during the Sephora VIB Spring sale. I had been using a trial sized version, and I was so impressed at how well it removed my makeup, while keeping my skin hydrated but not leaving behind a thick greasy film. It got off stubborn mascara, and rinsed off so well. I'm really loving this, and would recommend it to anyone who likes to use a cleansing balm as well. I don't want to go into too much detail about this one, just because I have a full review going up very soon about it. But I have to say, I LOVE IT! I don't find it too harsh for my skin. My skin doesn't look dry or flaky anymore when I apply makeup, and I find my skincare products are just sinking in so much better. I wish it wasn't so expensive! I ordered some Real Technique brushes during the FTBBeauty sale. And I'm so happy I did! They have all been great for me, but these are the three that I have been reaching for the most throughout May. Blush Brush - this is so soft and fluffy! It applies blush great, and blends well. Buffing Brush - I use this to apply my powder, and just dab it on my face. It makes my skin look airbrushed! Deluxe Crease Brush - This really blends your shadows! It's a little bigger than your average crease brush, but it's dense and just blends your crease well! I got this in my May Boxycharm, and I was excited to use it. The first time I tried it, I wasn't so sure about it. But I kept giving it a go, and I like it! It applies foundation really quickly, and doesn't leave behind streaks. It's super soft, and is easy to use. I haven't tried it with powder products yet, because I've been loving it for my foundation.